Playing dice games in the classroom or at home is a great way to engage kids in a fun math activity. 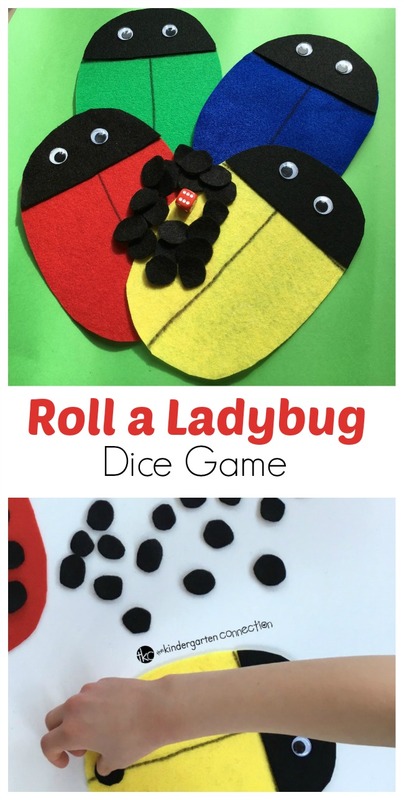 Our simple Spring themed Roll a Ladybug Dice Game focuses on counting, number recognition and understanding of one-to-one correspondence. It is perfect for kids in Preschool or Kindergarten to enjoy together or with their siblings at home. And it’s made with just a few craft supplies that are cheap and easy to source, if you don’t already have them on hand. 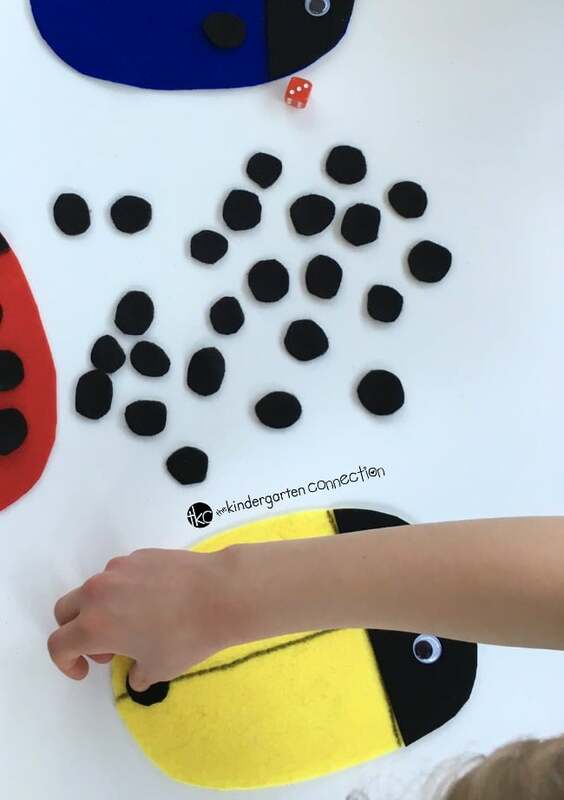 Cut out a Ladybug body and head from felt for each of the players. 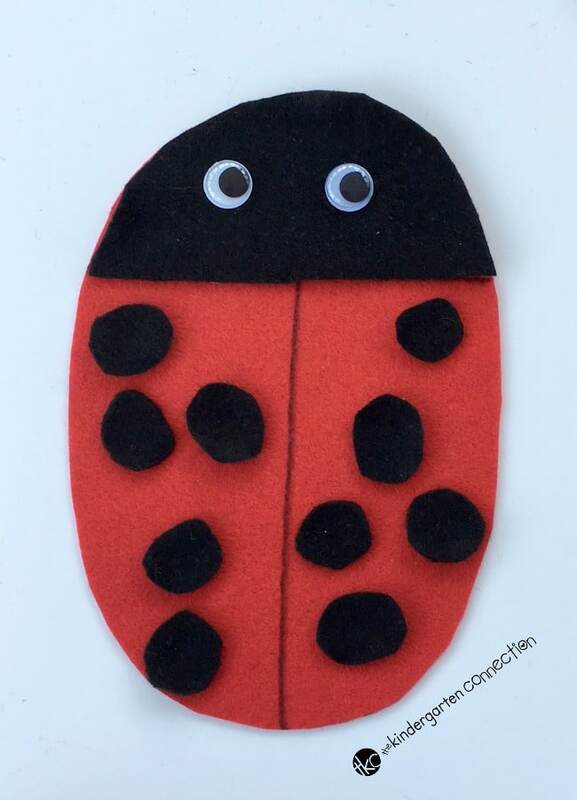 Cut out enough spots from black felt to go on each of the Ladybugs. Glue down the Ladybug head onto the body and then secure the googly eyes in place. Take a marker pen and draw down the center of the Ladybugs body to define her two wings. Aim of the Game – The first player to count out 10 spots onto their Ladybug is the winner. The youngest player always start in our house, so my daughter got us going with this game. 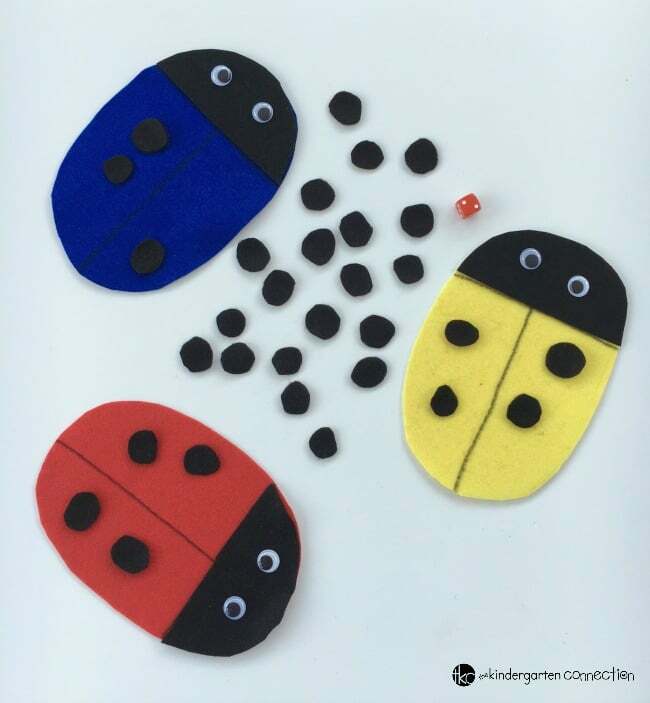 Once the dice has rolled, take a moment to give the player chance to have a good look at the dots on the dice and then count out the corresponding number of black spots onto their Ladybug. Encourage the other players to help out if somebody is struggling to work out the correct numerical digit on the dice. This is a great opportunity to strengthen subitizing skills (recognizing sets instantly without counting). Play continues until a player has successfully counted out 10 spots onto their Ladybug. Depending on the age and ability of the players, you could set a rule that they have to throw the exact number on the dice to finish their 10 spots on their Ladybug. This keeps the game going a little longer and also gets them thinking about beginning addition! Counting up to 10 in the correct order. One-to-one correspondence – learning how to count a similar group of objects one at a time, to count how many you have in total. Subitizing – can they recognize the number on the dice they rolled without counting the dots? Team Work – working together to help each other if they are struggling to work something out. Taking Turns – Learning to be patient when waiting for their turn and taking their turn in the correct order. Looking for more ways to practice counting, number recognition, and more? Hop over and grab our popular dinosaur counting cards, stick with a bug theme with our bug count and clip cards, or have a blast with more dice games with our roll and color dice games for the year! Nicola is a former Librarian who now spends her time looking after and coming up with arts,crafts and learning ideas for her two sons aged 6 and 8 and daughter aged 3, to enjoy doing together. She share crafts and fun ideas over on Crafty Kids at Home.